When you start harmonica, it can be hard to play ten holes. 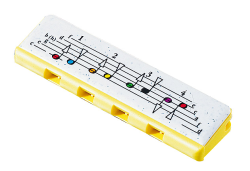 So Hohner make a special harmonica with just the four most important ones. That’s actually all you need for learning hundreds of popular tunes. 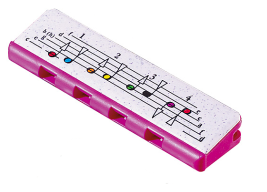 Because you play the harmonica by breathing out and in, each hole produces two different notes. This gives you four blow notes and four draw notes. That’s eight notes in all, or a whole octave: do-re-mi-fa-so-la-ti-do. If you look closely, you can see this printed on the cover of the harmonica. Each number indicates a hole, counting from left to right, 1 to 4. An upward arrow is the standard indication to blow. A downward arrow is the standard indication to draw (breath in). The holes are bigger too, so it’s easier to play. It’s called a Speedy harmonica. It’s great for learning new songs and it’s really cheap to buy. Speedy comes in blue, pink, black or yellow and is easy to carry in your pocket or in your school bag. If you already have a Speedy, it’s time to get playing. Just breathe gently through it – no need to force the notes. Now, see if you can follow this simple guide for playing all the notes. Remember each number tells you which hole to play. On this occasion B means blow and D means draw (breath in). Try playing up the harmonica and down again by reversing the sequence. Speedy comes in just one key to get you started. That’s the key of C major. So as we play each note, we can give it a name as we go. If you look at the end of each line and space on top of your Speedy, you will find the note names are printed too. 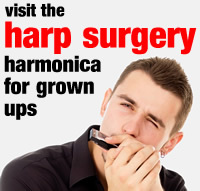 You have now learned to play your first scale on the harmonica. Well done! Now it’s time to try out some of our tunes for the 4 hole harmonica.